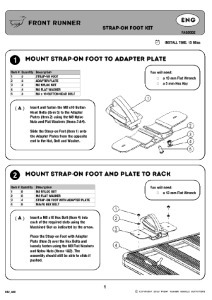 Front Runner Strap-On Feet cargo carrying roof rack kits come in various sizes and easily mount to the Mercedes Benz G Class GL's existing factory/OEM roof rails. This kit includes 8 locking Strap-On Feet and a 1255mm(W) x 1560mm(L) Slimline II Tray. Hello, Is it possible to fit a Maggiolina Airlander LARGE size on this rack "MERCEDES BENZ G CLASS GL SLIMLINE II ROOF RACK KIT - BY FRONT RUNNER" using the mount plates sold separately? Hi, Paul. The tent would need equal overhang on both sides, but on the GL it won’t be possible due to the boot door opening upwards.